Three terrorists planned to abduct soldier or civilian and bargain for release of PFLP boss Saadat. 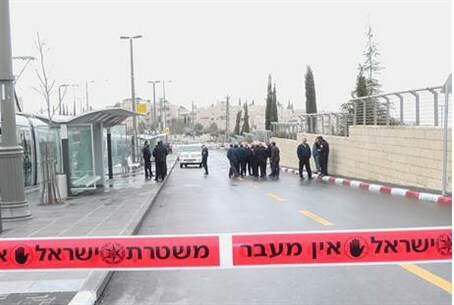 The Shin Bet, together with the IDF and Israel Police, have exposed a PFLP terror cell that planned shooting attacks and abductions for negotiating the release of terrorist prisoners. The cell's members were arrested before they could carry out their plans. Weapons were also found in the course of one of the arrests. The arrested cell members are all members of the PFLP terror group: Salem Dirdisawi, 40, of Ramallah, has already served several stints in jail for his activity in the PFLP. Ahmed Sheikh, 20, of Anata, was in jail between October 2011 and January 2012 for attacking an Israeli vehicle. Ahmed Alian, 22 of Anata, was also jailed in the past. Jisan Karaja, of the village of Tzafa near Ramallah, is a well known PFLP activist and recruiter in his village. The cell began operating in April and May of this year. They planned to abduct a soldier or a resident of the Jewish communities in Samaria, in order to bargain for the freedom of PFLP boss Ahmed Saadat, who is in jail for various terror acts including the murder of Minister Rechavam Ze'evi. The cell also planned to fire at soldiers at the Maccabim checkpoint and collected intelligence to this end. Another plan was to carry out an attack at the Jaba checkpoint, and use a motorcycle for a quick getaway. Alian is employed as a security officer in the Palestinian Authority and had a stash of weapons, which included a Glock handgun, a Yericho handgun, and an M-16. Dirdisawi had a Kalashnikov assault rifle and a box of ammunition. The weapons were confiscated. The men have been charged with conspiracy to fire at a person and possession of weapons. The Shin Bet noted that the arrests "once again show the terror organizations' efforts and high motivation to carry out abduction attacks for bargaining over the release of prisoners in Israel."